This is a pretty easy Chicken and Rice Soup recipe. I doubled it today so I can freeze half of it for fast lunches. In large Dutch oven, heat olive oil over medium heat. Saute onions for 2-3 minutes. Add garlic, celery and carrots and saute another 2-3 minutes. Add 4 cups chicken broth and bring to a boil. 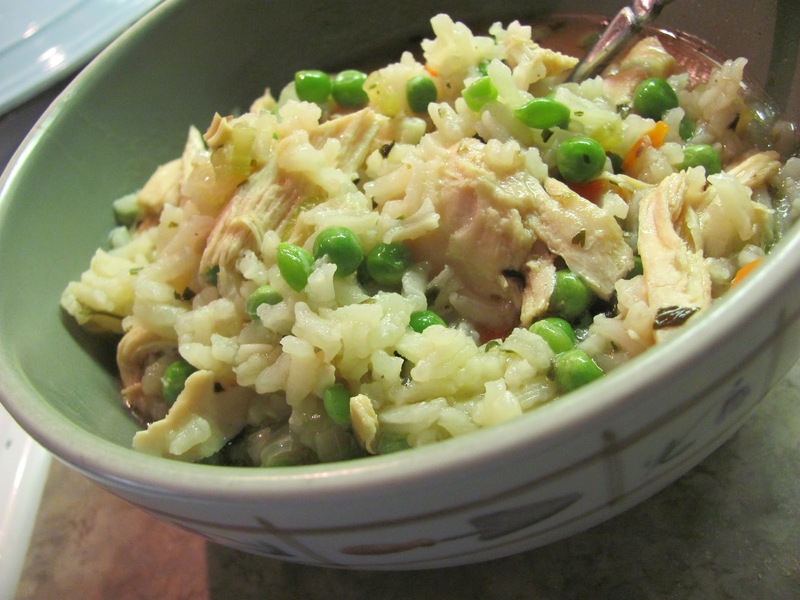 Add pre-cooked chicken, rice and seasonings and reduce heat to low and simmer for 15 minutes. Add remaining 2 cups of chicken broth and serve with fresh parsley, if desired. For the double batch, I doubled everything above and cooked according to the above directions with this exception: before adding the remaining broth, spoon equal amounts of soup into a muffin tin to have individuals servings later. Wrap the muffin tin in plastic wrap and then tin foil and put it in the freezer. Freeze the soup overnight. To remove the frozen soup from the muffin tin, carefully place the muffin tin in a sink filled with warm water for 1 minute (don't submerge the tin, you don't want soggy soup). Line your counter top with a tea towel or plastic wrap and flip the tin over and twist to pop the soup out. Sort of like when you pop ice cubes from an ice cube tray. They should pop right out, if not, put them back into the warm water for a minute and then try again. Once they have popped out, you can put them in storage baggies or containers and keep them in your freezer when you're ready to eat them. When I was single living on my own, I did this with all types of soup. I still do it today with leftovers to avoid reheating a whole pot that will get thrown away. I hope you found this helpful! This recipe was linked to Life as Mom. Featured you on our Fantastic Fridays shout-out! Feel free to grab our award button! Thanks for some great cooking ideas.